Made in Nunavut provides the first behind-the-scenes account of how the Government of Nunavut (GN) came into being, exploring the many political and administrative issues that arose in its design and implementation. 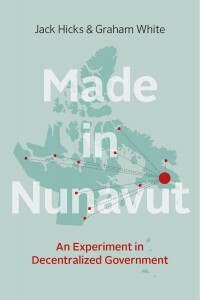 The book offers a close analysis of the period between the passage of the Nunavut Act in 1993 and the start-up of the GN in 1999, paying close attention to its most distinctive and innovative organizational design feature — the decentralization of offices and functions that would normally be located in the capital to small communities spread across the vast territory. It examines how this decentralization was implemented post-1999 and concludes by taking a hard look at whether the GN’s controversial structure has provided better government for the people of Nunavut. The result of nearly two decades of research and writing by leading authorities on the politics of the Canadian Arctic, Made in Nunavut is a definitive guide to understanding the structure and politics of Canada’s youngest territory.